Ex-Texas cornerback Kris Boyd is not interested in talking about Lil’Jordan Humphrey’s time in the 40-yard dash. When asked about the reaction to Humphrey’s slow times at the NFL scouting combine, Boyd emphatically stated that “don’t mean nothing.” Check the film instead, Boyd protested. If he recalled correctly, not too many people were talking about Humphrey’s speed when he turned this past season’s 86 catches into 1,179 yards and nine touchdowns. Humphrey, however, conceded that scouts may not feel the same way about the 4.75-second time he posted in Indianapolis. 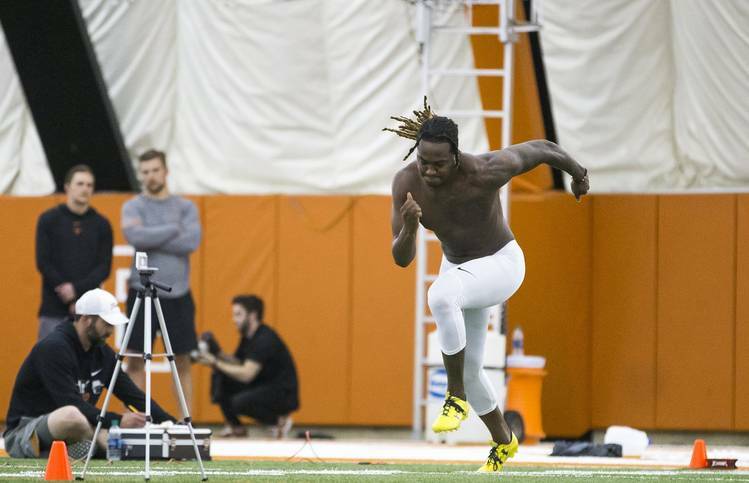 So, Humphrey chose to run at UT’s pro day on Wednesday to “show that I’m not that slow.” With the reaction to his previous performance serving as a motivation, Humphrey said he heard unofficial times in the 4.6-second range for Wednesday’s two runs. Humphrey, who left school a year early, held court with several scouts at the conclusion of workouts. Humphrey didn’t do any receiver drills but did work on blocking drills. Would the 6-4, 225-pound Humphrey transition into a tight end at the next level? Light workout: Boyd and fellow cornerback Davante Davis were two of UT’s five representatives at last month’s combine. Since they went through the customary tests in Indianapolis, they only participated in position drills on Wednesday. Both said it was an advantage to not have to worry about the 40-yard dash and bench press. Boyd’s 19 reps on the bench press led all cornerbacks at the combine. It was a question asked during a team interview that captured the most attention, though. One unnamed team asked Boyd if he had both of his Testicles. Boyd told a media scrum at Texas that he thought the question was “weird” but figured it was something all prospects were asked. “I’m surprised it blew up like that. I didn’t think it would,” he said. Bonney is back: Ex-Longhorns Tristan Nickelson and Daje Johnson, neither of whom played at Texas this past season, returned for pro day. SMU-bound quarterback Shane Buechele also made an appearance and threw for his former teammates. The most surprising appearance, however, may have been John Bonney’s. He played at Texas from 2014-17, but the defensive back spent the 2018 season at Texas Tech as a graduate transfer. After participating in Texas Tech’s pro day on Monday, a grateful Bonney said that UT coach Tom Herman gave him another chance to showcase his talents in front of the scouts.